Hello friends! 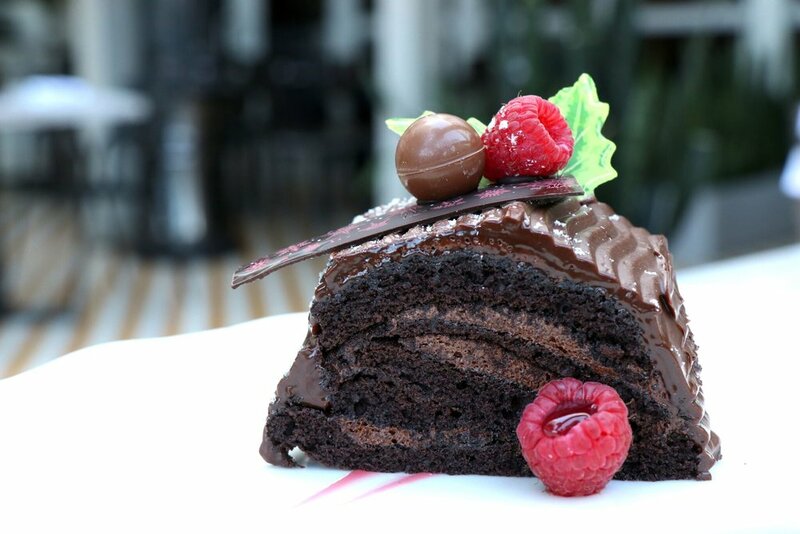 The Confidante Miami Beach released a recipe for their holiday Eggnog Yule Log! I can't quite make it down to Miami to try it at their restaurant, Bird & Bone, but I'm really looking forward to trying it for Christmas Day dessert! Preheat oven to 350 degrees, line 2 half sheet trays with parchment paper, spray with cooking spray. Sift flour into a medium bowl add baking powder, nutmeg, ginger and cinnamon. Whisk to combine. On a double boiler combine the eggs, brown sugar and salt, whisk until warm. Transfer to a stand mixer, whisk on medium speed for 5 minutes until foamy and light, turn to high speed until ribbony and thick. Reduce speed to medium, drizzle oil followed by the booze and vanilla. Sprinkle flour and gently incorporate the dry ingredients. Spread on baking sheets and bake until it feels firm to the touch about 15 min, take out and cover with aluminum foil immediately. Combine all filling ingredients and warm to spreadable consistency. Remove the foil from the cake, spoon the filling evenly on to the cake leaving 1in margin all around the edges. Roll the cake starting from the long side using the parchment paper, position the rolled up cake seam side down. Cover the surface with more Ganache. Refrigerate until ganache has hardened. Cut 3 to 4in pieces on a bias. Let me know if you try it! Don't forget to subscribe to get updates from my blog and follow me on social media!